There isn't any one ideal weight that is suitable for every teenage girl. What is considered a healthy weight range for girls varies based on a number of factors, including their age, height and developmental state. A teen's pediatrician can determine whether she is at a healthy weight and provide strategies to get there. Although weight is an important aspect of a girl's health, it is only one factor that determines overall well-being. Not everyone at the same age and height should necessarily weigh the same amount, especially in the teenage years. Body type and stage of development make a difference, as girls tend to gain more body fat as they go through puberty and develop larger breasts and hips. However, you can get a general idea of what is healthy for a girl at a given age by looking at the weight-for-age charts used by many pediatricians. For example, at 13 years old, the average weight for a girl is about 101 pounds. The average weight for a 15-year-old girl is about 114 pounds, and that of an 18-year-old girl is about 123 pounds. Keep in mind that these are average weights, not necessarily the ideal weights, which are usually expressed in a range rather than a single number. A person's ideal weight range also depends on her height. Doctors typically use body mass index percentiles to determine whether a teenage girl is within the right weight range. BMI is calculated by dividing weight in kilograms by height in meters, then dividing the total by height in meters again. The resulting BMI can then be looked up on a chart that gives BMI-for-age percentiles for girls. Anything between the 5th and 85th percentile is considered normal. For a 13-year-old girl, a BMI between 15.4 and 22.6 is within the normal range. For an 18-year-old girl, an acceptable range would be between 17.6 and 25.6. While BMI can be a useful screening tool, it shouldn't be the only tool used. It is an estimate of body fat, not an actual measurement. Thus, a girl who is very muscular or has a larger frame may not have a lot of body fat even though she has a higher BMI, while a small-framed girl without a lot of muscle could still have a low BMI even though she has a higher body fat percentage than is healthy. To really determine whether a teenage girl has too much body fat, other tests are needed in addition to the BMI calculation. For example, a pediatrician may use calipers to determine her skin-fold thickness in different places on the body to get another estimate of body fat. He might also use a test such as underwater weighing or bioelectrical impedance that actually measures body fat. Sometimes the doctor may measure the distance around a person's waist as another potential indicator of whether she is at a higher risk for certain diseases, as carrying too much weight around the waist increases the risk for some conditions. Teenage girls become dissatisfied with their bodies at alarmingly early ages these days, primarily due to exposure to the media, which tend to portray very thin girls as the ideal. This can lead teenage girls to try to become thinner than is healthy or to try to lose weight in unhealthy ways, such as fad diets and skipping meals. It's important that teenagers understand what a healthy weight really is. It's not necessarily a thin body or a number on the scale, but a healthy body that is not at risk for weight-related health conditions. 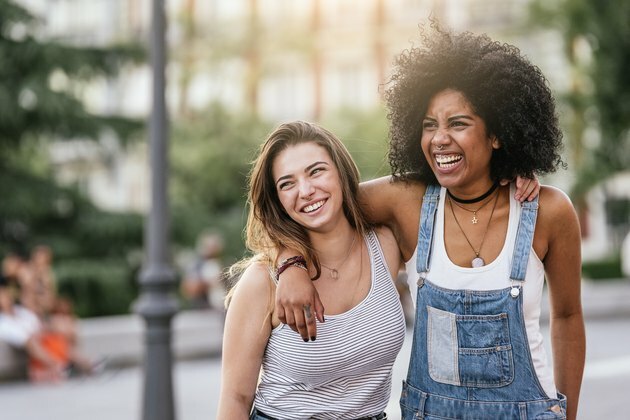 Teaching teens to focus on health over image will help them stay at a healthy weight and be realistic about trying to achieve the images they see in the media. Nemours TeensHealth: What's the Right Weight for My Height?